STRAUB Werke AG provides pipe connection technology and couplings for power applications. The firm offers high quality products, customer-oriented engineering excellence and highest service and support commitment for demanding connection solutions for piping systems made from all types of materials. 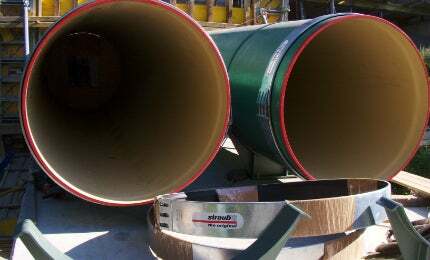 STRAUB’s well-proven coupling technology can be found in millions of pipe connections worldwide. It combines different pipe materials such as metal, plastic or GRP pipes for optimum solutions for customers. Pipe couplings meet customers’ requirements in a variety of specialist applications. Additional services related to the technique of positioning pipes will especially benefit those with more sophisticated and specific challenges. From consultancy and planning to extensive project support and proper documentation, STRAUB will assist you in completing your projects successfully. There are many advantages to using STRAUB pipe couplings. These include the fact that they provide system independence, as they can connect the most varied pipe materials. Flexible pipe connection is also a benefit, as is the easy assembly of the product, with it being light-weight and due to the fact that there is no pipe end preparation. Safe installation is also provided to customers, as there is no risk of fire or explosion and no protective measures are required. The pipe couplings are also cost-saving, thanks to their short installation times and modest down-times. STRAUB pipe couplings can be used in a number of different fields. These include hydropower plants, nuclear power plants, renewable energy and water supply / waste-water treatment. Industrial application, ship building and offshore pipe couplings are also in industrial applications. There are two main types of STRAUB pipe couplings, STRAUB-GRIP and STRAUB-FLEX. STRAUP-GRIP is unique in that it is pull-out resistant, whilst the STRAUB-FLEX pipe couplings are axially flexible. STRAUB pipe couplings also have different properties. The progressive sealing effect is when both the pressure in the pipe and the force on the sealing lips both increase, due to the flow through the pressure equalisation channel. A progressive anchoring effect can be seen when the axial loading on the pipe increases due to increased internal pressure or external influences. When this happens, the teeth bite even deeper into the pipe to compensate. Whenever pipes need to be connected reliably, quickly and easily, STRAUB is your partner. Based on the well-proven original Straub coupling technology, which can be found in millions of pipe connections worldwide, we combine different pipe materials, such as metal and plastic for optimum solutions for customer's permanent pipe couplings, which meet their requirements to the full extent, and can be found in a variety of special applications.